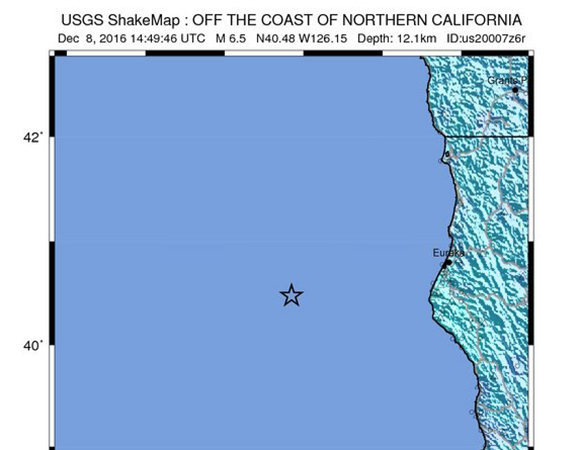 The December 8, 2016 M6.5 earthquake 160km west of Ferndale, California, occurred as a primarily strike-slip event in the seismically active zone at the boundary between the Gorda and Pacific plates off the coast of California. 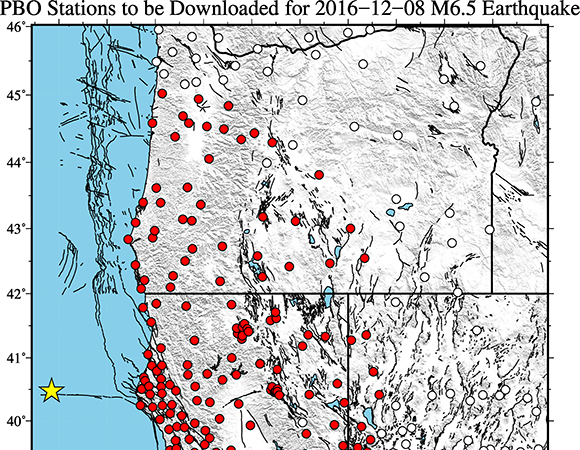 In response to the M6.5 earthquake 160km west of Ferndale, California on 2016-12-08 at 14:49:46 UTC, UNAVCO is downloading high rate GPS/GNSS data from 214 PBO stations within 500 km of the epicenter. 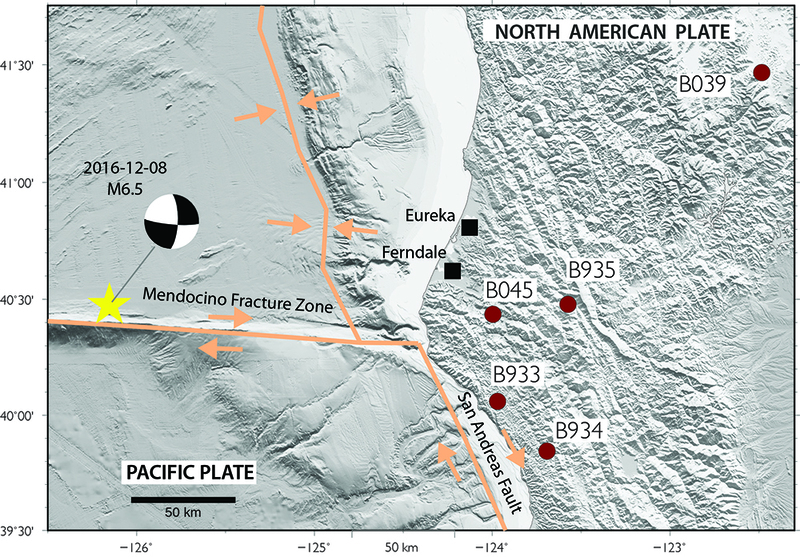 Note: The stations being downloaded are the same as those downloaded following the 2014-03-10 M6.8 Ferndale earthquake. 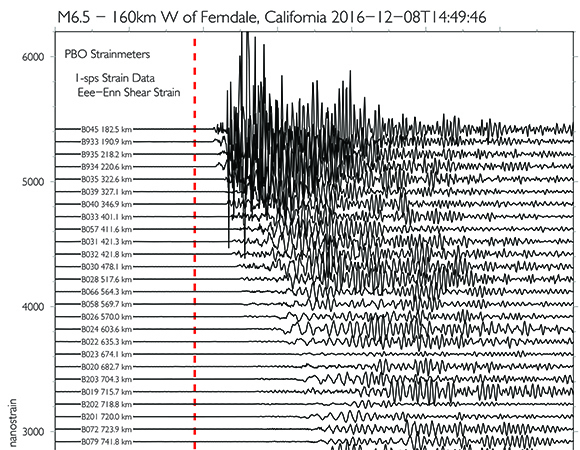 One-sample-per-second (1-sps or 1 Hz) data will be collected for a 6-day period (± 3 days) around the event. 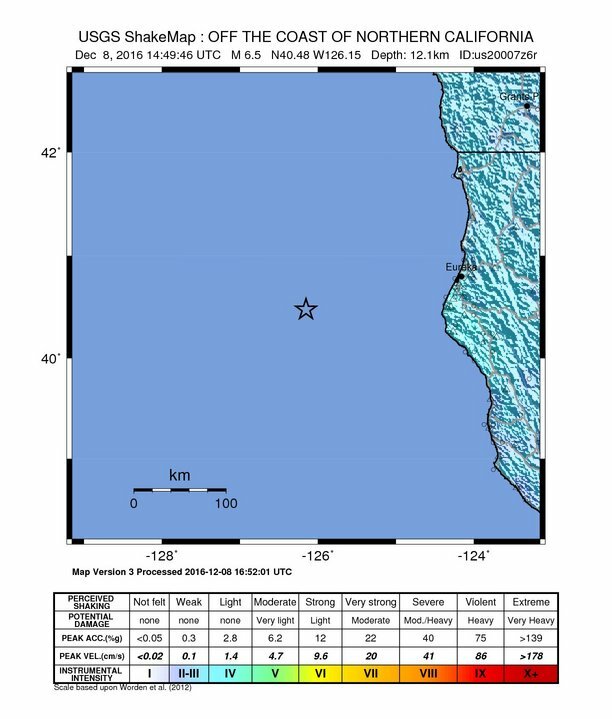 Five-sample-per-second (5-sps or 5 Hz) data will be collected for a 12-hour period (± 6 hours) around the event. 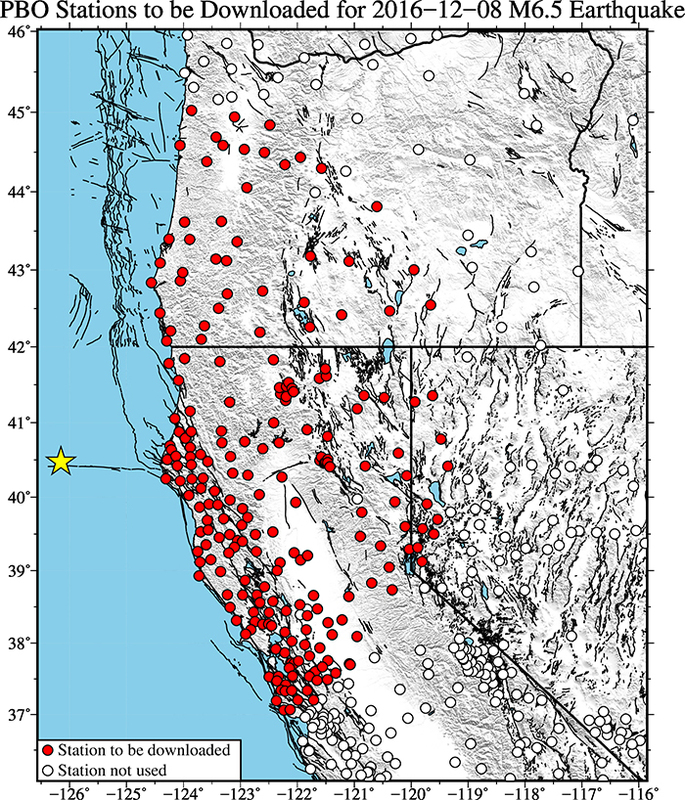 These data will be available from the UNAVCO ftp site. 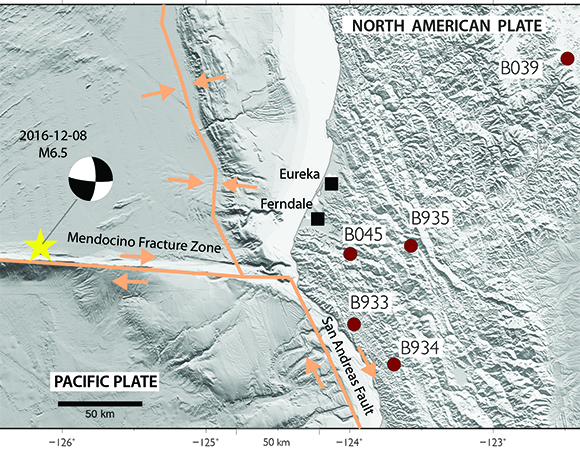 The GAGE GPS Analysis Center Coordinator will estimate coseismic offsets, if any, at stations affected by this event. 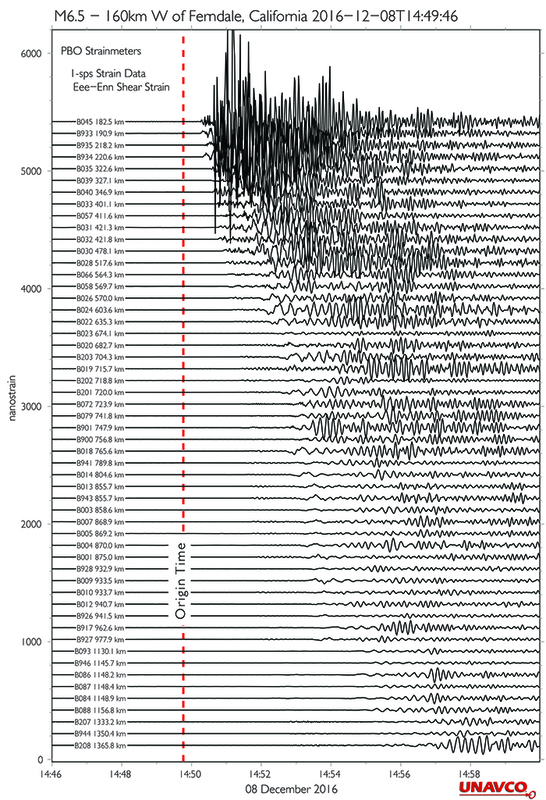 UNAVCO has already produced a fully processed 1-sps borehole strainmeter (BSM) dataset spanning the time period of this event, available from the PBO borehole strainmeter event response page.